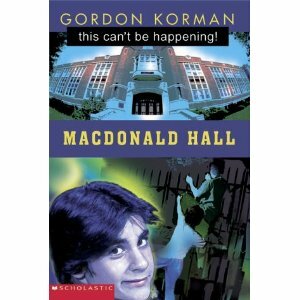 Most of the summer, my son has been absorbed by the Macdonald Hall series, by Gordon Korman. Set in a Canadian boarding school, it's all about the antics of Bruno Walton and Boots O'Neal, who share a dorm room - and get into a lot of mischievous fun. The MH books are real page-turners, with lots of action and just enough character development so that you get to know the quirks about the kids who live and study at Macdonald Hall, but not so much that the book gets bogged down. For instance, there's the clumsy kid who can always be counted on to stumble over his own feet and smash everything to the ground (think Lucille Ball carrying a big chocolate cake); Elmer is the smart one, who can hear a bird in the forest and instantly name it; Bruno is the guy who's never met an adventure he didn't like - and will do anything for his school; and Boots is Bruno's long-suffering best friend who tries to talk sense into Bruno but eventually gets dragged into all of his schemes. And of course, there's Fish (Mr. Sturgeon), the strict but lovable headmaster. While it's set in a boys' school, Korman also has two feisty female protagonists who attend the girls' finishing school just over the highway. Not only do they assist in many of the boys' schemes, but they start up a few of their own. What kind of things do the MH kids get up to? In one book, they want to buy a new pool for the school so they hold all kinds of massive fundraisers - without the knowledge of the Fish. In another one, a major movie star (think Justin Bieber) shoots a movie at the school and Bruno tries to get himself into every shot possible. And in others, the boys try to thwart a new dress code and a change in dorm-room assignments. These may sound like pretty tame plots, but Korman makes them exciting and interesting. Boys, especially, will giggle out loud. Here's something really cool that you need to know about the first book in the Macdonald Hall series (This Can't be Happening!). Gordon Korman wrote it when he was 12. Yes, he was 12. As in, at 12 years old he wrote his first book - but not only that, a book that would become an award-winning series. But not only that... a series that would endure to the present day, when it's still every bit as funny and interesting and relevant as the day it was written. 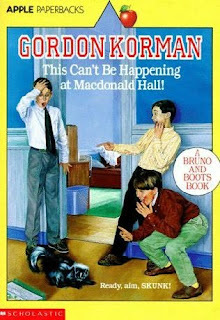 Scholastic has revamped the Macdonald Hall series, giving them new covers and updating some of the information. For instance, the boys use computers and e-mail - something I'm quite certain they didn't do in the original books. But they haven't changed too much (in fact there are still some anachronisms in the books). The one thing my son and I were a bit miffed about - and I think it's kind of a major error - is that Scholastic listed the books out of order in the frontispiece of each book. For instance, on the back of Beware the Fish! it says it's "The third fearlessly funny book in the Macdonald Hall series." But it appears as number four in the list - in every MH book. 1) This can't be happening! Incidentally, want to know how my son found out about the Macdonald Hall books? They were my husband's favourite books when he was growing up. From father... to son. Way to go, Gordon Korman. I have to send a shout-out to Scholastic's awesome Nikole Kritikos (who I'm quite certain had nothing to do with the frontispiece mix-up), who just sent me Gordon Korman's latest book, Swindle. My son and I will be gobbling that one up in no time - as soon as he's finished Schooled, by GK. By the way, did you know that Gordon Korman was named after Gordie Howe? He was. Lots more information on Gordon Korman's website. A big THANK YOU for this page. I have been searching on and off the past couple of years for this series but could never remember the author, characters, publisher, or pretty uch anything about hte book except the theme of two boarding school boys constantly getting in trouble. I remember reading this at my pulbic library in grade 6/7. We didn't have the money back them to purchase the books back then whenever the scholastic catalogue came to my school, so I made a promise to myself to purchase them when I'm older. I"m going to order them from scholastic. Hopefully my future kids will find Bruno and Boots as entertaining as I did when I read it to them. Thank you so much. That's great! It was my husband who was rediscovering his love of these books, by giving them to our son. Great literature really is timeless.